8080F, Software Filter from SoulviaSound. 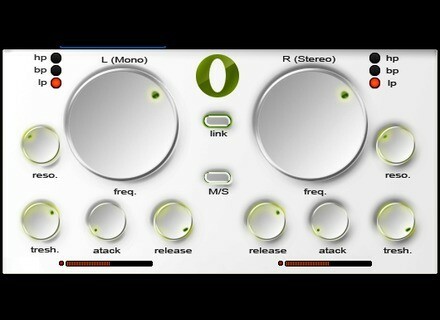 SoulviaSound has released 8080F sidechain filter for Reaktor. 8080F is a side chain filter ensemble with M/S processing. It's a creative tool designed for pads processing. For example, 8080F can be used to modulate the cutoff envelope with an audio signal. 8080F allows processing of the stereo (side) signal or application of a low pass filter on the mono (mid) signal and a high pass filter on the stereo (side) signal while the cutoff envelope is modulated independent in the mono and stereo signal. The cutoff envelope is modulated by the difference between the side chain signal and the threshold settings with attack and release settings. For feeding the 8080F side chain the user can send an audio signal in the 3/4 inputs from Reaktor 5 in a DAW (Ableton Live, Logic, Cubase, Reaper, Pro Tools) or NI Maschine. 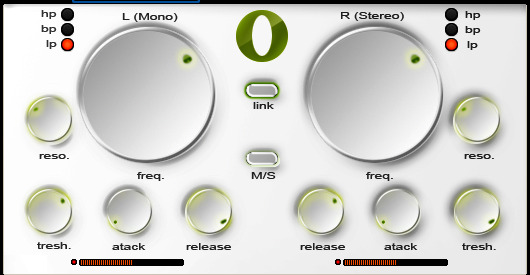 The user has independent controls for both channels (L-Mono/R-Stereo) but can also control the filter parameter in link mode by pressing the link switch and tweaking the left parameters. Avid Pro Tools 9.0.5 Update Pro Tools 9.0.5 is an officially qualified and recommended update for all Pro Tools 9 and Pro Tools HD 9 users on Mac OS X 10.6.x (Snow Leopard) and Windows 7. Five12 Numerology 3.1 Five12 has released Numerology 3.1. When Alien Drum Robots Attack 2 Loopmasters has released When Alien Drum Robots Attack 2, a sample library from Goldbaby Productions.